Several communities around the country continue to ask the very basic question, “Who should own and operate our airport?” For many years, the main decision was whether to transfer responsibility from a multi-purpose government to an airport authority. In more recent years, the idea of transferring responsibility for an airport to a private operator has gained traction in many communities. Connecticut Airport Authority. 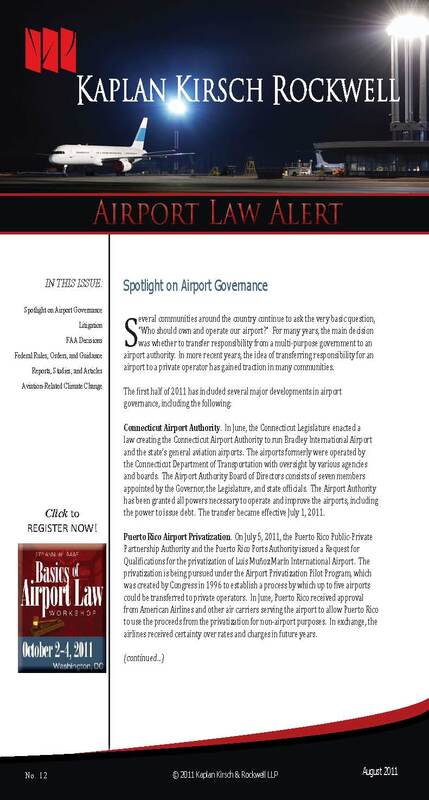 In June, the Connecticut Legislature enacted a law creating the Connecticut Airport Authority to run Bradley International Airport and the state’s general aviation airports. The airports formerly were operated by the Connecticut Department of Transportation with oversight by various agencies and boards. The Airport Authority Board of Directors consists of seven members appointed by the Governor, the Legislature, and state officials. The Airport Authority has been granted all powers necessary to operate and improve the airports, including the power to issue debt. The transfer became effective July 1, 2011. Puerto Rico Airport Privatization. On July 5, 2011, the Puerto Rico Public-Private Partnership Authority and the Puerto Rico Ports Authority issued a Request for Qualifications for the privatization of Luis Muñoz Marín International Airport. The privatization is being pursued under the Airport Privatization Pilot Program, which was created by Congress in 1996 to establish a process by which up to five airports could be transferred to private operators. In June, Puerto Rico received approval from American Airlines and other air carriers serving the airport to allow Puerto Rico to use the proceeds from the privatization for non-airport purposes. In exchange, the airlines received certainty over rates and charges in future years. Privatization Discussion. In March, the American Association of Airport Executives and LeighFisher Management Consultants convened a conference in San Francisco: Airport Privatization in a Global Market – Is it Time for the U.S.? The conference sessions considered all aspects of privatization from the perspective of private operators, airports and investors. In addition, a team led by LeighFisher and including Kaplan Kirsch & Rockwell is preparing a Guidebook on airport privatization for the Transportation Research Board’s Airport Cooperative Research Program. Ontario International Airport. Debate continues on whether and how to alter the ownership and operation of Ontario International Airport. ONT is located within the City of Ontario in San Bernardino County, but is owned and operated by the City of Los Angeles through Los Angeles World Airports (LAWA). Commercial traffic has declined markedly in recent years. In January, LAWA sought expressions of interest from private operators. LAWA received 10 responses, but has not taken any further action. In February, California State Senator Bob Dutton introduced a bill (State Senate Bill 446) that would authorize creation of a new Ontario International Airport Authority, but would not require Los Angeles to transfer ownership of ONT. Nevertheless, the Los Angeles City Council voted unanimously in June to oppose the bill. On December 30, 2010, the California Court of Appeal affirmed the trial court’s award of $30 million, plus attorneys’ fees, to a private developer for the Town of Mammoth Lakes’ breach of a development agreement concerning the Mammoth-Yosemite Airport. Mammoth Lakes Land Acquisition LLC v. Town of Mammoth Lakes, 191 Cal. App. 4th 435 (2010), review denied, 2011 Cal. LEXIS 3076 (Cal., March 23, 2011). The agreement authorized the developer to build a hotel or condominium complex at the Airport and also included an option to purchase Airport property in a future year. The FAA objected to the planned non-aeronautical use of Airport property and to the purchase option. As a result, the Town asserted that it was federally prohibited from complying with the development agreement. The trial court found, and the appellate court affirmed, that, regardless of whether the development agreement may be inconsistent with Grant Assurances restricting the use and sale of airport property, the agreement was not made subordinate to the Assurances. In short, there was no basis upon which the Town permissibly could refuse to comply with the development agreement. The court specifically found that a statement in the development agreement that it was subject to “applicable rules and regulations of the FAA” did not cover the Grant Assurances. This case presents a cautionary tale of the risks to airports where leases, agreements, and other documents are not made explicitly subordinate to the Grant Assurances. In some circumstances, airports may have conflicting obligations to comply with contracts and the Grant Assurances. Proper subordination language can help an airport avoid such conflicts. TSA Scanners. The U.S. Court of Appeals for the District of Columbia Circuit held that the Transportation Security Administration’s decision to use advanced imaging technology (AIT) for primary passenger screening is subject to notice and comment rulemaking. In Electronic Privacy Information Center v. DHS, Case No. 10-1157 (D.C. Cir., July 15, 2011), the court also held that TSA’s use of AIT for primary screening does not violate the Video Voyeurism Prevention Act, the Privacy Act, or the Fourth Amendment of the U.S. Constitution. Aircraft Emissions. See Aviation-Related Climate Change for a discussion of Center for Biological Diversity v. EPA, Civ. Action 10-00985 (D.D.C., July 5, 2011). Security Fees. The U.S. Court of Appeals for the District of Columbia Circuit upheld the Transportation Security Administration’s calculation of fees imposed on airlines for screening passengers and property. In Southwest Airlines v. TSA, Case No. 10-1227 (D.C. Cir., July 1, 2011), the court denied the airlines’ petition for review based largely on the court’s deference to the calculation prepared by TSA’s consultant over the calculation prepared by the airlines’ consultant. Preemption. The Court of Appeals for the First Circuit held that a Massachusetts law governing tips, including those received by airport skycaps, is preempted by the Airline Deregulation Act. In Difiore v. American Airlines, Inc., Nos. 10-1108, 1167, 10-1264 (1st Cir., May 20, 2011), plaintiffs challenged the airline’s curb-side luggage checkin fee on the basis that, under the state tips law, such a fee is required to go to the employee providing the service rather than the employer. The court found that the state tips law related to airline price and service and therefore is preempted. The opinion follows a long line of cases broadly interpreting the Airline Deregulation Act and other statutes with similar express preemption provisions. Preemption. In National Federation of the Blind v. United Airlines, Inc., No. C 10–04816 WHA (N.D. Cal., Apr. 25, 2011), the court dismissed a class action suit against United Airlines alleging failure to make kiosks accessible to blind persons, finding that plaintiffs’ claims that a state disability law had been violated were preempted by the Airline Deregulation Act and the Air Carrier Access Act. Tort Claims. The U.S. District Court for the District of Puerto Rico denied passenger’s motion for summary judgment against the airport owner and janitorial company. In Carr, et al. v. Puerto Rico Ports Authority, et al., Civil No. 10–1170(SEC) (D.P.R., Apr. 15, 2011), the court found insufficient proof as a matter of law that defendants violated a duty to plaintiff, which caused plaintiff to slip and fall. Tort Claims. The Court of Appeals for the State of Washington reversed a trial court order on summary judgment and remanded a matter involving an accident at the Seattle-Tacoma International Airport. In Afoa v. Port of Seattle, No. 64545-5-1 (Wash. Ct. App., Feb. 22, 2011), the court rejected the Port’s argument that it lacked sufficient control over plaintiff’s ground handling activities so as to owe a common law or statutory obligation to provide a safe working environment. Review is pending in the Washington Supreme Court. Inverse Condemnation. In Love Terminal Partners, et al. v. United States, No. 08–536 L (Fed. Cl., Feb. 11, 2011), the court granted plaintiff’s motion for summary judgment in part, holding that the Wright Amendment Reform Act of 2006, prohibiting the use of 26.8 acres at Dallas Love Field Airport to which plaintiffs hold long-term lease rights, effected a per se taking without just compensation. Preemption. The Court of Appeals for the Second Circuit held that a local regulation requiring a tree removal permit at a private airport was not preempted. In Goodspeed Airport LLC v. East Haddam Inland Wetlands and Watercourses Commission, et al., No. 10-516-cv (2d Cir., Feb. 10, 2011), the court found that the local requirements did not sufficiently interfere with federal aviation regulations to be preempted, especially where applied to a small private airport over which the FAA had limited direct oversight. Airport Access Restrictions. The Court of Appeals for the District of Columbia Circuit denied the City of Santa Monica’s petition challenging the FAA’s final determination that the ban on Category C and D aircraft at the Santa Monica Airport violates the Grant Assurance against unjust economic discrimination. In City of Santa Monica v. Federal Aviation Administration, No. 09-1233 (D.C. Cir., Jan. 21, 2011) the court held that the FAA did not act arbitrarily or capriciously in concluding that the ban violated Grant Assurance 22. Donald J. Trump v. Palm Beach County, Florida, Case No. 10-15543-E (FLA. CIR. CT.) In this case, Donald Trump, who owns property in Palm Beach County near the Palm Beach International Airport, asserted trespass, nuisance, and inverse condemnation claims against the County, alleging that it has failed to control noise properly at the airport. The Court dismissed the complaint but granted Trump leave to file an amended complaint. Trump filed an amended complaint raising the same claims, and the County filed a renewed motion to dismiss the amended complaint. The Court heard argument on the motion to dismiss on July 29 and a decision is expected soon. Tinicum Township, et al. v. City of Philadelphia (Tinicum II), Case Nos. 10-4576 & 10-4701 (3d Cir.). Tinicum Township is appealing a district court ruling that Tinicum is preempted by federal law from using its land use authority to prevent the City of Philadelphia from acquiring and using land in Tinicum for the Philadelphia International Airport Capacity Enhancement Program. The case has been briefed and oral argument is scheduled for September 16, 2011. A decision is expected in early 2012. Tinicum Township, et al. v. U.S. Dep’t of Transportation, et al. (Tinicum III), Case No. 11-1472 (3d Cir.). Tinicum Township is challenging the FAA’s Record of Decision approving the City of Philadelphia’s Capacity Enhancement Project (CEP) for Philadelphia International Airport. The case has not been briefed, but the Township has indicated that it intends to argue that the FAA’s approval of the CEP failed to comply with NEPA, the Clean Air Act, the Clean Water Act, and the Magnuson-Stevens Fishery Conservation and Management Act. Briefing is expected to be completed by late 2011. Spirit Airlines v. DOT, Case No. 11-1219 (D.C. Cir.). Spirit Airlines is challenging the Department of Transportation’s “Enhancing Airline Passenger Protections” (also known as the “Airline Passengers’ Bill of Rights”), which requires airlines to provide more transparency in pricing, refund baggage fees if a passenger’s baggage is lost, and provide increased bumping compensation amounts, among other things. DOT’s rules were issued in April 2011, and the case is still in the early stages of litigation. National Federation of the Blind v. Clark County, Nevada, Case No. 2:2011-cv-00474 (D. Nevada). In this class action suit, brought under the National Rehabilitation Act and the Americans with Disabilities Act, the plaintiff seeks to compel Clark County to enable the self-service kiosks at McCarran International Airport to accommodate blind travelers. The case is in the early stages of litigation; the County has filed a motion to dismiss. Stanton v. Fort Wayne – Allen County Airport Authority, Case No. 1:11-cv-00030-TLS-RB (N.D. Indiana). In this case, a man who wanted to distribute copies of the U.S. Constitution and other leaflets in protest of the new airport security screening methods at the Fort Wayne International Airport is challenging the Airport Authority’s rules that relegated him to a designated “free-speech zone” outside the terminal. The plaintiff, who is being represented by the ACLU, recently filed a motion for summary judgment. In RDM, LLC v. Ted Stevens Anchorage International Airport, FAA Docket No. 16-09-14 (June 7, 2011), the Director found that Respondent State of Alaska did not violate Grant Assurance 22 (Economic Nondiscrimination) or Grant Assurance 23 (Exclusive Rights) in requiring performance milestones in a lease for an air cargo development project, and for terminating the lease upon Complainant’s failure to meet required milestones. In Valley Aviation Services, LLP v. City of Glendale, FAA Docket No. 16-09-06 (May 24, 2011), the Director found that Respondent City of Glendale (1) violated Grant Assurance 19 (Operation and Maintenance) and Grant Assurance 29 (Airport Layout Plan) by allowing non-aeronautical use of airport hangars for storing non-aviation items and for operating nonaviation-related industries; (2) violated Grant Assurance 22 by failing to equitably apply its prohibition on non-aeronautical use of hangars to all tenants; (3) violated Grant Assurance 22 by requiring Complainant to reduce its rental rates based on Respondent’s flawed appraisal; and (4) did not violate Grant Assurance 24 (Fee and Rental Structure) or Grant Assurance 25 (Airport Revenue) by failing to collect taxes and fees for commercial and non-aeronautical businesses operating on the Airport. In Paskar v. City of New York, FAA Docket No. 16-11-04 (May 24, 2011), the Director docketed a Part 16 complaint against the Port Authority of New York and New Jersey, challenging a proposed marine waste transfer station near LaGuardia Airport, but dismissed the complaint as to named respondent City of New York, on the basis that the City is not an airport sponsor. In Skydive Sacramento v. City of Lincoln, California, FAA Docket No. 16-09-09 (May 24, 2011), the Director found that the Respondent City of Lincoln violated Grant Assurance 22 by denying Complainant Skydive Sacramento access to an identified drop zone at the airport. In Orange County Soaring Association, Inc. v. County of Riverside, California, FAA Docket No. 16-09-13 (Feb. 11, 2011) the Director found that the Respondent Riverside County violated Grant Assurance 22 for failure to make the airport available for glider operations. The court also found that the airport sponsor violated Grant Assurance 29 and Surplus Property Act deed restrictions. In Ricks v. Greenwood-Leflore Airport/Airport Board, FAA Docket No. 16-09-04 (Jan. 24, 2011), the Director found that Respondent Airport Board was not in violation of Grant Assurances 2, 5, 19, 22, 23, or 29 for terminating Complainant’s lease, for not offering another site to Complainant, and for not compensating Complainant for relocation expenses. In Davis v. Jackson Municipal Airport Authority, FAA Docket No. 16-10-01 (Jan. 18, 2011), the Director found no violation of Grant Assurance 30 (Civil Rights) and Grant Assurance 37 (Disadvantaged Business Enterprises) for establishing race conscious DBE goals on federally funded projects. FAA Reauthorization. On July 20, 2011, the House passed its 21st short-term extension of FAA programs. However, instead of passing a clean extension, the House added language that would eliminate Essential Air Service (EAS) subsidies for 13 communities in 10 states. The Senate and House were unable to agree on terms of an extension by the expiration of the previous extension at the end of Friday, July 22. As a result, the FAA was forced to furlough approximately 4,000 employees, lost its authority to impose passenger ticket taxes, and stopped many projects funded under the Trust Fund. Air traffic controllers and other air safety and essential functions are not affected by the furlough. Congress is entering its August recess without having resolved the impasse. For further information and updates on the FAA shutdown, please visit http://www.faa.gov/ or visit http://aci-na.org/ or http://aaae.org. Transportation Security Administration (TSA) Authorization. The Committee on Homeland Security of the U.S. House of Representatives has started its process for reauthorizing the Transportation Security Administration (TSA) by holding two hearings (on June 2 and July 12) to explore various issues in both the aviation and surface sectors. The hearings addressed risk-based passenger screening, trusted traveler initiatives, air cargo security, information sharing, and ways to enhance and streamline TSA initiatives. To watch webcasts of the hearings, please visit http://homeland.house.gov/subcommittee-transportation-security. Airport Security Screening Opt-Out Program. In January 2011, TSA Administrator John Pistole announced that TSA would not expand the Screening Partnership Program (SPP), which allows airports to opt-out of using federal screeners and instead use private screeners, because TSA did not see a clear or substantial advantage to expanding the program. Five pending airport applications for the program were denied. In response, House Homeland Security Chairman Peter King (R-NY) introduced H.R. 1586, the Secure Enhancement and Jobs Act of 2011, which establishes a 120-day deadline for TSA to approve or deny airport SPP applications, and specifically requires TSA to reconsider the SPP applications of airports that were pending as of January 1, 2011, and to provide reasons for any denial. Under the legislation, the failure by TSA to approve or deny an application within the 120-day timeframe would result in the automatic approval of the application. TSA recently announced that it is now permitting airports to submit (or resubmit) applications to participate in the program. TSA states in the application for the program that the agency will not approve an application for SPP unless the applicant shows that there is a “clear and substantial benefit” to doing so. Information on the content and status of bills can be found at http://thomas.loc.gov/home/thomas.php. Final Rule, Limited Extension of Effective Date of Certain Provisions, Enhancing Airline Passenger Protections, 76 Fed. Reg. 45181 (July 28, 2011). Notice, Notice of FAA Intent to Carry Over Airport Improvement Program (AIP) Entitlement Funds, 76 Fed. Reg. 44978 (July 27, 2011). Notice of Proposed Rulemaking, Reporting Ancillary Airline Passenger Revenues, 76 Fed. Reg. 41726 (July 15, 2011). Change 1 to FAA Order 5200.11, FAA Airports (ARP) Safety Management System (effective May 31, 2011). Notice of Proposed Rulemaking, Disadvantaged Business Enterprise: Program Improvements for Airport Concessions, 76 Fed. Reg. 30898 (May 27, 2011). Final Rule, Enhancing Airline Passenger Protections, 76 Fed. Reg. 23110 (April 25, 2011). Notice of Petition, Policy, and Procedure Concerning the Use of Airport Revenue, Policy Regarding Airport Rates and Charges: Petition of the Clark County Department of Aviation to Use a Weight-Based Air Service Incentive Program, 76 Fed. Reg. 21420 (April 15, 2011). Airport Sponsor Assurances (Revised March 2011). Compliance Guidance Letter 2011-1: FAA Implementation of Interim Policy Regarding Access to Airports From Residential Property and Review of Access Arrangements (March 21, 2011). Interim Policy, Airport Improvement Program (AIP): Interim Policy Regarding Access to Airports from Residential Property, 76 Fed. Reg. 15028 (March 18, 2011). TRB Airport Cooperative Research Program, Report 44: A Guidebook for the Preservation of Public-Use Airports (July 2011). Government Accountability Office Testimony, TSA Has Taken Actions to Improve Security, but Additional Efforts Remain, GAO-11-807T (July 2011). Government Accountability Office Report, TSA Has Enhanced Its Explosives Detection Requirements for Checked Baggage, but Additional Screening Actions Are Needed, GAO-11-740 (July 2011). TRB Airport Cooperative Research Program, Report 47: Guidebook for Developing and Leasing Airport Property (June 2011). Government Accountability Office Report, General Aviation: Security Assessments at Selected Airports, GAO-11-298 (May 2011). TRB Airport Cooperative Research Program, Report 43: Guidebook of Practices for Improving Environmental Performance at Small Airports (April 2011). Congressional Research Service, Essential Air Service: Frequently Asked Questions (March 2011). Government Accountability Office Letter, TSA’s Revised Cost Comparison Provides a More Reasonable Basis for Comparing the Costs of Private-Sector and TSA Screeners, GAO 11-375R (March 2011). TRB Airport Cooperative Research Program, Legal Research Digest 11, Survey of Minimum Standards: Commercial Aeronautical Activities at Airports (Feb. 2011). Government Accountability Office Testimony, Airport and Airway Trust Fund: Declining Balance Raises Concern over Ability to Meet Demands, GAO-11-358T (Feb. 2011). DOT Office of the Inspector General, FAA Did Not Ensure Revenue Was Maximized at Denver International Airport, Report No. AV-2011-057 (Feb. 2011). J. Vacek, Civilizing the Aeronautical Wild West: Regulating Unmanned Aircraft, 23 Air & Space Lawyer, No. 3 (2011) (subscription required). M. Bisset and G. Crowhurst, Is the EU’s Application of its Emissions Trading Scheme to Aviation Illegal?, 23 Air & Space Lawyer, No. 3 (2011) (subscription required). Climate Change Litigation. In July 2011, the U.S. District Court for the District of Columbia issued an order in Center for Biological Diversity v. EPA, Civ. No. 10-00985 (D.D.C., July 5, 2011) concluding that the U.S. Environmental Protection Agency (U.S. EPA) has an obligation under the Clean Air Act to consider whether the greenhouse gas and black carbon emissions of aircraft engines endanger public health and welfare. This issue is critical because the Clean Air Act explicitly requires U.S. EPA to regulate emissions that it determines endanger public health and welfare. Based on its conclusion, the court refused to dismiss a complaint filed by environmental interest groups seeking to compel USEPA to proceed with the regulation of non-road vehicles and aircraft. Although the Clean Air Act does not establish a clear timeframe for EPA action, this decision puts more pressure on EPA and FAA to address this issue in the near future, including efforts to establish some form of standards through the International Civil Aviation Organization (ICAO). EU Trading System. ICAO is itself facing pressure to establish international aviation-related climate standards from European States which have recently incorporated aviation emissions into European Trading System (ETS) for carbon dioxide emissions. Based on announced sector emissions caps for 2012, international climate consultancy Point Carbon estimates that airlines will face approximately $1.9 billion in ETS compliance costs in 2012, and up to $9.5 billion in 2020. American airlines, through the Air Transport Association of America (ATA), have sued in the European Court of Justice, arguing that the inclusion of aviation emissions in the ETS violates international treaties related to air travel. As Firm partner, John Putnam recently explained in The New York Times, the European court’s decision in the ATA case will have a significant effect on the likely speed with which aviation emissions are addressed on a regulatory basis in the absence of a global aviation emissions agreement by ICAO. Climate Change Legislation. The U.S. Congress is again examining climate change. However, rather than exploring an economy-wide or electric-sector cap-and-trade program, the House of Representatives’ attention has now turned to efforts to strip EPA of its Clean Air Act regulatory authority over greenhouse gas emissions and/or its funding to implement climate regulations. The House FY2012 Interior/Environment Bill, as reported out of the Appropriations Committee on July 12, 2011, included provisions to: prohibit implementation of stationary source greenhouse gas regulations for one year after final adoption; nullify greenhouse gas emissions permitting requirements and permits issued by the federal government; and prohibit adoption of permit conditions relating to greenhouse gas emissions. Whether these provisions will survive reconciliation with the Senate’s appropriations proposal remains uncertain. The House is also considering legislation to prohibit U.S. aircraft operators from participating in the European Union’s ETS and direct the Secretary of Transportation and the FAA Administrator to engage in international negotiations to ensure that U.S. aircraft operators are held harmless from E.U. emissions trading schemes.